1. Heat the oil in a large skillet over medium high heat. Sprinkle the chicken with the salt, pepper, and chili powder. Sauté in the oil for a few minutes, ﬂipping the chicken now and then to cook through and get a nice golden color on both sides. When the chicken is cooked, remove from heat and set aside. 2. Cut and prep all the vegetables and fruits. When the chicken is cool enough to handle, cut into bite-sized pieces. Place the salad ingredients in a large bowl – you can either arrange the bowl by ingredient, like pictured, or toss everything together. Refrigerate to chill. 3. For the dressing, puree all the dressing ingredients in a food processor until smooth. Taste and adjust to your preferences. 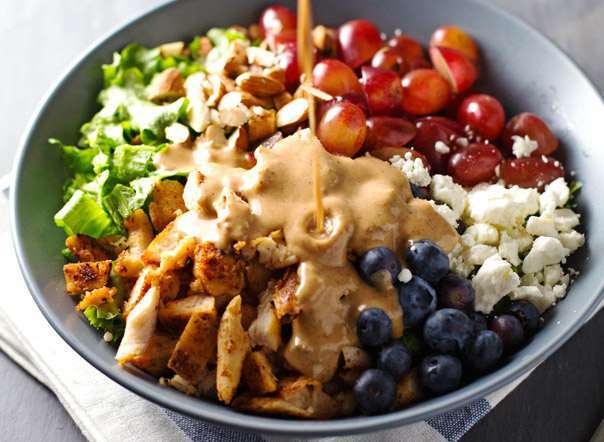 Pour dressing over salad, serve, and enjoy!